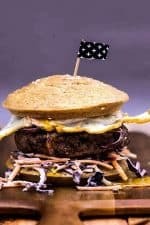 Looking for some flavorful keto burger buns? Then look no further. These are mainly made from almond flour and a star ingredient: diced Spanish chorizo. These keto burger buns are very different from my other Paleo hamburger buns. Those are light and work for other things, like Paleo sloppy joes (which is the main thing I use them for) and these ones are full of flavor from the added chorizo, which completes ground beef so nicely. It took me three attempts to figure out how to properly make these; they had to pass three very important tests: shape, taste, and sponginess. But finally, I got there and I’m really happy with the results! The biggest problem for people who follow the Keto diet is finding a good substitute for bread because, although bread is comfort food and we can survive without it, everyone will agree with me that a burger without bread is not a burger. It’s a hamburger patty, which is just depressing and not that exciting at all. My first batch didn’t turn out so well. I literally spit out my first bite when I tried it. For the second batch, I took into account the result from the night before and I made a little change by adding less apple cider vinegar and flax meal. The result was ok but only that. I had a strong feeling that there was just something missing or not right with the recipe – do you ever get that feeling? On the last and final attempt, I acted as if there was a surgical operation in progress and placed all ingredients on the kitchen counter perfectly aligned and I resolved to either figure it out or give up. So, here we go: Almond flour, coconut flour, flax meal, baking powder, baking soda, salt, sugar, eggs, apple cider vinegar, garlic powder, and sesame seeds. Oh, and chorizo… yep, I felt I had to somehow experiment, so I added some diced Spanish chorizo. The baking: operation time was as I expected, quick and easy. Five minutes later, the buns were baking in my oven with me anxiously watching them through the oven door hoping that they rise as they should. To avoid having to wait until after I had taken my photos, I had planned ahead and made five. This meant I was so impatient to wait and try them as soon as they were cooked so I could try one and find out if my third (and almost certainly my final – if it failed) was a success or not. Taste: The buns have been created with just the correct amount of ingredients so you can’t taste any one particular ingredient over another. I was a bit concerned that the buns would taste too nutty or sour – as the first batch did that ended up on the kitchen floor. 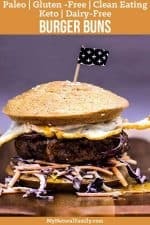 But the perfect bun flavor is just enough to allow the burger its prominence, which is what really matters in this dish. Oh, and my extra little something… if you like chorizo, I highly recommend adding some in, it really gave extra flavor to the bun and the burger. Sponginess: It can be tough to achieve a light and spongy texture using almond flour. However, if you use the correct amount of eggs and flour, they will give the dough greater volume. Now the important bit: The burger! The burger is of course 100% Keto, and I added some homemade Paleo coleslaw with Paleo mayo. On top of the coleslaw, a succulent beef burger, followed by a slice of red onion. To top off this delicious tower of Ketoheavenliness, I couldn’t leave out a fried egg! I know, it’s so messy to eat it once the egg yolk breaks, but… I just love it! Oh, and to complete the perfect dish, you shouldn’t forget the Paleo sweet potato fries. I hope you will be as impressed as I am?! As you can see, this burger meal is not that different from a conventional burger meal. So go for it… I hope I have encouraged you to make these keto burger buns and, as always, I would love to hear from you on how yours turned out and what you thought! Looking for tasty Paleo burger buns? Then look no further. These are mainly made from almond flour and a star ingredient: diced Spanish chorizo. Heat the oven to 350 F (180 C), then grease a Yorkshire pudding tin. In a large bowl, mix together the almond flour, coconut flour, flax seeds, baking powder, baking soda, and salt. Add the eggs and vinegar then mix until they are combined. Add the chorizo and mix it with the dough. Using a spoon, fill the pudding holes making sure to not overfill them with the batter. Sprinkle the top with some sesame seeds and carefully transfer the tin to the oven and bake for 20-25 minutes. Check them inserting a skewer into the center of the bun; this will have to come out clean. Let them cool. They can be stored at room temperature. Enjoy!